The actress and model Monica Bellucci, who has appeared in more than 60 films in a career than began in 1990, was born on this day in 1964 in Città di Castello in Umbria. Bellucci, who is associated with Dolce & Gabbana and Dior perfumes, began modelling to help fund her studies at the University of Perugia, where she was enrolled at the Faculty of Law with ambitions of a career in the legal profession. But she was quickly brought to the attention of the major model agencies in Milan and soon realised she had the potential to follow a much different career. Bellucci, whose father Pasquale worked for a transport company, soon began to attract big-name clients in Paris and New York as well as Italy, but decided not long into her modelling career that she would take acting lessons. She claimed to have been inspired by watching the Italian female movie icons Claudia Cardinale and Sophia Loren and gained her first part in a TV miniseries directed by the veteran director Dino Risi in 1990. The following year she made her big screen debut with a leading role in the film La raffa, directed by Francesco Laudadio. Her first major international movie came in 1992, when she played one of the brides of Dracula in Francis Ford Coppola’s Gothic horror film Bram Stoker’s Dracula. Other movies for which Bellucci is well known include Persephone in the 2003 science-fiction films The Matrix Reloaded and The Matrix Revolutions. She also played Malèna Scordia in the Italian-language romantic drama Malèna (2000), directed and written by Giuseppe Tornatore from a story by Luciano Vincenzoni, which won the Grand Prix at the 2001 Cabourg Film Festival. She starred in the controversial Gaspar Noé arthouse horror film Irréversible (2002), and Mel Gibson's biblical drama The Passion of the Christ (2004), in which she portrayed Mary Magdalene. At 50, she became the oldest Bond girl ever in the James Bond film franchise, playing Lucia Sciarra in Spectre (2015). In her simultaneous modelling career, Bellucci soon became known as one of the most beautiful women in the world. She appeared in the 1997 Pirelli Calendar as well as calendars for the magazines Max and GQ, for which she posed for leading photographers Richard Avedon, Fabrizio Ferri and Gianpaolo Barbieri. She has endorsed Dolce & Gabbana, Fendi and many major world brands, including Alessandro Dell'Acqua and Blumarine, has been on the cover of Elle and Vogue magazines and in 2012, she became the new face of Dolce & Gabbana. Bellucci has been married twice, first to a young Italian photographer of Argentine origin, Claudio Carlos Basso, from whom she separated after a few months. She had a six-year relationship with the Italian actor Nicola Farron until on the set of the film L'appartamento she met the French actor Vincent Cassel, whom she married in 1999 in Monte Carlo. They had two daughters, Deva, and Léonie, but they divorced after 14 years. She lives with her daughters in Paris, and also owns a house in Lisbon. Città di Castello, where Bellucci was born, is a town 55km (34 miles) north of Perugia that is rich in history, with an artistic heritage that dates back to the patronage of the Vitelli family in the 15th century. Works by great artists of the 15th-16th century such as Signorelli, Raffaello, Rosso Fiorentino and Raffaellino del Colle can be found there. 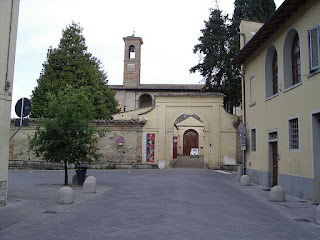 The 14th century church of San Domenico and the Palazzo Vitelli alla Cannoniera are worth visiting, in particular the latter, which now houses the Municipal Art Gallery, with some impressive 15th century paintings including paintings by Raphael, Lorenzetti, Ghirlandaio and Signorelli and a sculpture by Ghiberti. Bellucci grew up in San Giustino, just outside Città di Castello, where the imposing Bufalini Castle is an impressive sight. 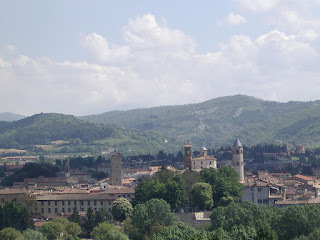 Perfectly preserved, it was built in the 15th century as a military fortress, a border post at the boundary between the Papal States and the Florentine Republic. The church of San Giustino at the centre of the town was built on the site of a large seventh-century parish church founded by the Christian martyr Giustino. The church of the Santissimo Crocifisso is rich in frescoes and stuccos by the Della Robbia brothers.